Congratulations! You just hit level 10. And now you are exposed to the daunting world of Alternate Advancements. But not to worry, because this guide is here to help! Alternate Advancements, or AAs for short, are a means of further enhancing your character. In addition to levels, they are a means of measuring how powerful your character is relative to other characters of the same class. Different AAs have different effects, including statistical boosts like Critical Chance, to enhancing different spells by giving them additional effects or simply improving the spell, to granting completely new spells altogether. All AAs will either provide a fixed bonus to your character or your spells and combat arts, or will scale up with your level by a relative amount with each level. The AA window can be opened by opening your "Character Development & Alternate Advancements" window (keyboard shortcut L). There are buttons on the left for different AA categories, and tabs across the top when appropriate to that category. There are two modes: View mode and Build mode. Switch between modes via a button in the lower right of the AA window. In build mode there is a save button to the right. Use it to save an AA profile. In View mode there is a drop-down menu in the upper right of the window. Use this to select an AA profile or load one from your hard drive. The Class tab unlocks at level 10. The Subclass tab unlocks at level 10. The Tradeskill tab unlocks at tradeskill level 20. The Shadows tab unlocks at level 50. The Sentinel's Fate tab unlocks at level 80. The Heroic tab unlocks at level 85. The Prestige tab unlocks at level 90. Class tab, pictured below, is shared among both Subclasses of your Class (for example, Summoner tab is shared by Conjuror and Necromancer). Your starter is required to begin the Class tree. Each starter will grant you an ability, as well as increase your base stats per point you spend. You only need to spend one point to continue, but you may spend up to 10 AA points into the ability if you wish. The bulk of AAs must be bought in order, starting from the top and going down. These lines are labeled (from left to right) the Strength, Agility, Stamina, Wisdom, and Intelligence lines. To unlock the next AA in each line you must purchase four points into the previous ability. The more points you invest into an AA, the more powerful the AA is. Each ability has 10 ranks, costing 1 point each. The endlines are the final AA in each line. They require 22 overall spent points in each line to unlock, and 2 points to purchase (making the minimum AA investment for each endline a total of 24 points). These abilities only have one rank. Purchasing these endlines also grants you a prefix title. The Sentinel's Fate Attributes become available once have spent a total of 70 in the Class tree. These are independent AAs from the rest of the Class tree and do not have any requirements. Each ability has 8 ranks costing 1 point each. The Sentinel's Fate Attributes endline requires spending 16 points in Sentinel's Fate Attributes to unlock. These endlines each have 2 ranks that cost 2 points. The overall investment in your Class tree to unlock the Sentinel's Fate endline is 88 points for one rank, and 90 points for two ranks. Subclass AAs vary greatly depending on your class, and will probably not resemble the picture below. These AAs are only available to your specific subclass (Conjuror AAs are not available to Necromancers, for example). Subclass Alternate Advancement trees have been reformatted. The connections have been removed and the tree is now formatted in rows. The first row contains four abilities and requires no points spent to access. The second row contains five abilities and requires five points spent in the Subclass Tree to access. The third row has six abilities and requires ten points spent in the Subclass tree to access. The fourth row has six abilities and requires 15 points spent in the Subclass tree to access. The fifth row is the endlines - now known as Expertise abilities. These abilities unlock every 20 points spent in the Subclass tree above them. At 20 points spent, you can select one Expertise ability. At 40, 60 and 80 points spent, additional Expertise abilities can be purchased. The sixth row is Sentinel's Fate Expertise abilities, and unlocks when 70 AA points have been spent on your Subclass tab. The last AA is unlocked after spending 10 points in the Sentinel's Fate Expertise AA. The Shadows Tree is a little bit different than the previous trees, but functions very similarly to the Sentinel's Fate tree. In the General line, the are AAs available to all players regardless of class. Each ability has 5 ranks costing 1 AA point each. The Archetype line unlocks once you have purchased 10 AA in the General tree, and 60 AA total. The Archetype AAs are available to all subclasses in each Archetype (Fighter, Priest, Mage, and Scout). The six AAs each have 5 ranks costing 1 AA point each. Spending 10 AA total in the Archetype line unlocks the Archetype endline, which costs 1 AA to purchase. The Class line represents AAs available to your Class (the same subclasses available in your Class AA tree, see above). The Class line unlocks once you spend 10 AA in the Archetype line, and 120 AA total. In general (but not always) each ability has 5 ranks costing 1 AA point each. Once you have spent 10 AA in the Class line, the Class endline unlocks, which costs 1 AA to purchase. The Subclass line represents AAs available to your Subclass, and not to any other subclass. This line unlocks once you spend 10 AA in the Class line, and 170 AA total. In general (but not always) each ability has 5 ranks costing 1 AA point each. Once you have spent 10 AA in the Subclass line, the two Subclass endlines unlock. Each Subclass endline has 1 rank and costs 2 AA apiece to buy. Purchasing them will also grant your character a Prefix and/or Suffix title. Added with Destiny of Velious, the Heroic tab (shown below) unlocks at level 85 and when you have spent 200 points globally. It has a 50 point spending limit. The first row are general AA's, and are available immediately. The second row are Class-specific, and require 10 points spend in the Heroic tree. The third and fourth rows are Subclass-specific. Row four requires 20 points spent in Heroic and 250 points spent globally. The fourth row requires 48 points spent in Heroic and 275 points spent globally. New with Tears of Veeshan, the Dragon AA are archtype-based. There are four vertical progressive columns, with a maximum of 10 points per AA. At the bottom are four "floating" AA which require one point, and are unlocked after you spend 30AA in the column above it. You may spend only 100 AA total in this tree. Introduced in Game Update 61 (GU61), crafting classes now have their own alternate advancement tab which unlocks at tradeskill level 20. This AA is earned through the normal course of gameplay by completing crafting quests or adventuring. The AA points used in this tab are from the same pool of AAs used in the adventuring tabs! Because you can only spend 160 AA total below level 70, it is impossible for someone below level 70 to purchase the Shadows Subclass abilities. The Sentinel's Fate AAs are completely unavailable to anyone below level 81. Although it would imply you can spend a total of 270 AAs at levels 81-90, the overall hard cap on AAs is 350. You will need to spend wisely! There are multiple ways to respecialize your AAs. In each of the major cities there are NPCs that will sell you AA respecs for an ever-increasing rate. These NPCs may also be placed in guild halls as amenities. Advancement Counselors are also purchasable as Guild Hall amenities. In your /claim window there may be a "Class Alternate Advancement Respec Card" which will grant you five chances to respec your Class AAs for free. The Advancement Counselors may also give you a free "Subclass Alternate Advancement Respec Card", which will grant you five free Subclass AA respecs. 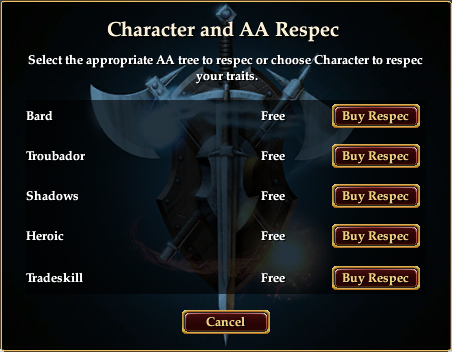 To purchase additional respecs will cost money, which increases in value the more you purchase a respec. After you purchase your 5th respec and beyond, waiting 30 days (real life time) will reset your respec cost to 10 gold. There are several ways to earn Alternate Advancement points. Do note that you must be level 10 to earn AA points at all. Players keep banked or used AAs and will be auto-granted AAs up to 280AAs at or before level 90. The 280AA bauble available in the store will be raised to 320AAs and usable at level 10. Players with unused “Touch of the Steward” items given with the Chains of Eternity expansion which grant 280AAs will find it now usable at level 10 (down from level 90). All characters will be updated to the new system which will include granting AAs for levels earned. Example: a Level 48 character will be granted 133AAs in the new system. If a Level 48 character is below 133AAs when we launch the new system, they’ll be set to 133AAs. If they are above 133AAs, their AAs will remain unchanged. In both cases, that character will be granted 3 points at level 49, and 5 points at level 50. With your AA slider set to any number above 0%, every time you earn combat experience from killing monsters, you will earn AA experience. Note that this reduces your regular experience. Virtually all named monsters and NPCs, and even a few non-named NPCs, will award AA if killed. You can tell if a named monster will award AA by targeting them and looking for a star icon in your target window. The more difficult the monster (solo, heroic, epic x2 to epic x4) and the higher the level of the monster, the more AA points are awarded. Do note that the monsters have to con at least green, and normally award you combat experience, to earn AA experience (no free kills from grey-con mobs). It does not matter the size of your group or raid when you kill a named mob. Most quests above level 10 will award AA. Virtually all one-time quests, and repeatable quests (the first time only) will award AA points upon completion. It does not matter whether the quest cons grey to you, only that you complete the quest. The more important the quest (Hallmark, Signature, Heritage, etc), the more difficult the quest (Solo, Heroic, Epic), and the higher level the quest, the more AA you will earn. Any time you complete a collection quest, you will earn AA experience. Do note that you also must be level 10 (if you turn in collections at level 9 or below, you do not earn AA experience!). Whenever you loot certain status and other rare items for the first time, you will earn AA experience. A Mirror of Reflected Achievements is an object that goes into your house and, essentially, allows you to have two AA builds. It is a crafted item, available to all crafters of level 75 or higher after gaining enough faction with their city's crafting guild. It also requires a reflective smoldering shard, an NPC drop from Kunark and Shadow Odyssey instances. The mirror itself is LORE and NO-TRADE, so you can only have one AA mirror in your house. Because it is NO-TRADE, it must be crafted via the commission window. It is highly advised that you acquire a Mirror of Reflected Achievements. There are oftentimes that you will want one AA spec for one situation, and another AA spec for another situation. Different classes each have their own AA builds. It is recommended you ask fellow members of your class what AAs you should get, and in what order. Be aware that some AAs will also have no use to you if you are below a certain level. Oftentimes some AAs increase the effectiveness of spells you may not have yet. Be sure to research this as you level. Also be sure you carefully read the description on AAs before you purchase them. They are often misleading and confusing. ZAM would like to thank Xalmat for the original, pre-Velious guide and pictures. This page last modified 2014-12-14 19:56:58.